No ka mea hoi, ua hoopuniia kākou e ia poe hōike he nui loa, e waiho aku kākou i nā mea kaumaha a pau, a me ka hewa e hoopili wale mai ana iā kākou, e holo kākou me ke ahonui i ka haihai ana i hoomaopopoia mamua o kākou. E nānā aku ana hoi iā Iesū, i ka mea nana i hookumu, nana hoi e hoohemolele ko kākou manaoio; nana hoi hoomanawanui i ke kea me ke manao ole i ka hilahila, no ka olioli i hoomaopopoia mamua ona, a noho iho hoi ma ka lima ākau o ka noho alii o ke Akua. Keawalai Congregational Church in Mākena was founded in 1832 as the Church of Honuaula. First built of pili grass, the church eventually was rebuilt as a stone-wood building. Members living near the beach gathered coral rocks for the making of the puna or cement, and those residing on the “forest side” brought down the lumber. K. Ke Kamana was the carpenter. At the right corner of the church, a Bible and a hymn book were placed and sealed by the minister Nueku who offered the prayer for the laying of the cornerstone. In 1856, the Sunday school raised $70 which was sent to the United States to buy a bell for the church. The bell arrived in January 1860 and was lifted to the belfry in February 1862. The land where the church now stands was purchased in 1864 for $80 - from Mahoe who donated $45 to the church. Donating $5 each to make up the balance of $35 were: Keliiaa, Kahanuala, Halama, Kealoha, Kapohakimohewa, Kenui, and the pastor, Kahu Manase. The land was surveyed by William Alexander and recorded with the government. The minister asked that the property, church and deed be turned over to the mission in Boston, but the members voted to retain the property as their own and elected the following trustees: Kapohakimohewa, Mahoe, Makuahine, Kaneiholani, Kalili, Kealoha, Halama, Kenui, and Makaole. The first four, along with Ehupili, Keniakua, Kaawaapahu, and Puupuu, served as deacons, who had charge of the worship services in the absence of ministers. From 1864 to 1870, Kahu Kaiwi was the pastor. 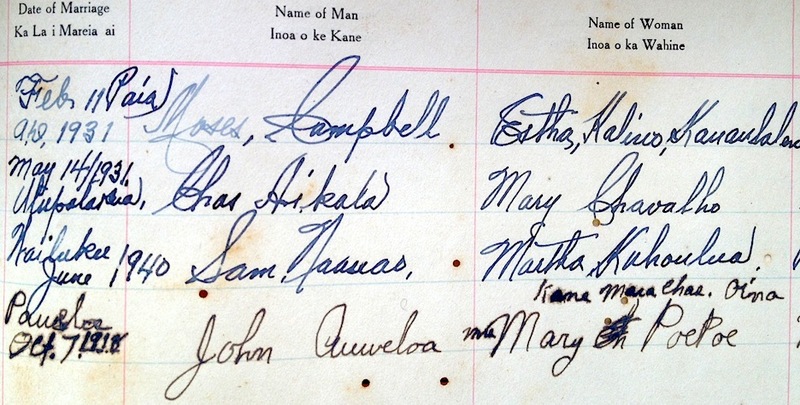 Church records were updated in 1876 when the list of members was divided by districts - namely Honuaula, Ulupalakua, Kanaio, and Keawakapu. After Kaiwi left, Kahu Kahale, pastor of Kaahumanu Church in Wailuku, was the supply pastor at Keawalai until January 1, 1878 when the church called Kahu Kauwe of Hāmākua, Hawaii. Church records then indicate an emphasis on repair work with funds received from donations. A succession of kahu were called to the church in the years which followed, including: M. Luuhiwa, J. S. Poepoe, Kaua'ulalena, Kaumeheiwa, Dodge, Nawahine, Pali, Kaili, Kaholokai, Daisy Kalaaupa, and Moses Moku. Kahu J.M. Kukahiko also served as pastor. Life in Mākena was not easy a hundred years ago and it did not get easier as time went on. First, because the weather pattern for the area changed, the once fertile lands became parched and the small farmers who lived in Mākena were forced to pick up and begin their lives again elsewhere on Maui. Of that number, some were the church’s most stalwart supporters. Then came the Great Depression. As was common in rural areas, support of the church and its kahu often took the form of offerings of chicken, eggs, pigs, or vegetables nursed to maturity in the now marginally acceptable agricultural climate. More people left for life where work was not so hard. 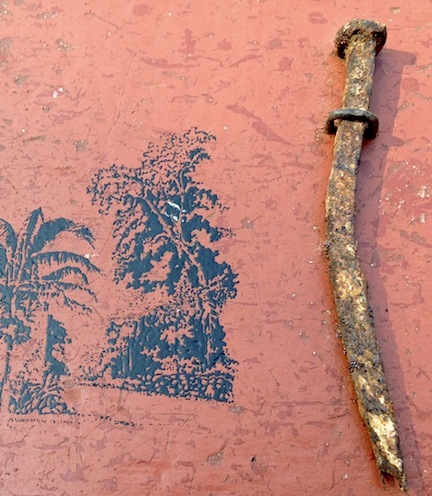 As the Second World War hit Hawaii so did pillage, thievery, and neglect at the church. One by one, heavy brass chandeliers that lit the church disappeared (read: Sue Johnson's story of the whale oil lamps' recovery). So did the hymn books printed in Hawaiian as well as the church’s written history and records. Between September 1951 and May 1952, the members of the church put their hands and ideas together in the same manner as their kūpuna and - with the help of many “good friends” - refinished and refurbished the venerable church inside and out. Its freshly painted steeple and roof were then visible from the heights of Ulupalakua and Kanaio. The new altar furniture was a gift in “loving memory” of Mother Hattie Chang by the Chang Ying family. 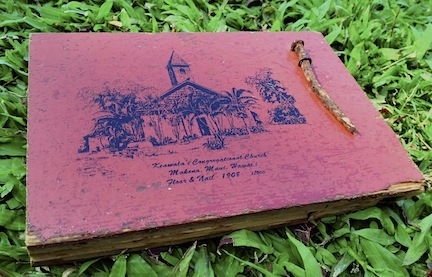 The new English hymnals and the English-Hawaiian New Testament were presented in “cherished memory” of Daniel Foo Sum by his wife, Wo En Lo Foo Sum, and their children. The plight of the church went virtually unnoticed until Kahu Abraham Akaka spearheaded a rededication of the church on May 25, 1952. The church structure was repaired and a new, revitalized spirit came over the small congregation. Membership rose to more than 40 and the church once again looked to its future with hope and expectation. Nothing could have been more fitting and proper than to have Haehae Kukahiko, an alert grandmother of 93 and the eldest member of the church at that time give the opening prayer. Kahu Daisy Kalaaupa was the leader of the sunrise service from 6:00 to 7:00 o’clock and Rose Milikaa was in charge of the Sunday school rally. The countryside rang out with the anthems sung by the 50-voice all-Maui Hawaiian choir directed by Alice Johnson. Members of the choir came from as far away as lower Nahiku to participate in the rededication services. Following Kahu Akaka’s sermon congratulations were extended by Charles R. Mounce, Moderator of the Aha Mokupuni of the Maui, Molokai, and Lānai churches and the sacrament of Holy Communion was administered by Kahu Theodore Schultz. A lūau followed, with special kōkua being received by the church from Edward Baldwin, Eddie Chang, Joseph Kalohelani, Abner DeLima, and many others. When the belfry collapsed in January 1968, the church members decided to build a new one and to do repairs on the interior, including replacement of the windows and doors. In 1975 the church building was in need of restoration and funds were raised by members and friends and the work undertaken. Maui contractor, Muneo Yamamoto, was given the task at a figure of $33,200. Under this amount the old roof was to be removed and all damaged rafters and trusses were to be replaced. The three doors to the church were also replaced. Exterior wood areas were cleaned and painted and the ceiling, walls and floor on the inside were also cleaned and painted. On May 16, 1976 a worship service was held with the rededication and a lūau. In 1992, members voted to restore the floor of the church. The previous floor was constructed in 1908 out of Douglas fir. The Floor Restoration Project was completed on October 2, 1994. The new floor is made out of ohia, a wood native to Hawaii. John Wittenburg of Kahakuloa was commissioned in 1992 to design and create a new cross in memory of Alberto Dafun. The cross is made out of milo and the base of the cross is made out of koa. The koa candlesticks and offering bowls were made by Ed Perreira of Haikū. In 1994, John Wittenburg was again commissioned, this time to design and create a new altar for the church. Made out of ulu, koa, milo, and iliahi, the altar was dedicated on Thanksgiving Sunday, November 19, 1995 along with 100 copies of The New Century Hymnal. The facing panels feature an ulu design, a symbol of immortality, that was carved by artist Dale Zarrella. John “Eb” Wittenburg, Jr. also offered his kōkua on the work. The petroglyph designs on the two pōhaku at the base of the pulpits include a family constellation of four individuals and the other of generations within a family. Both were carved by Dale Zarrella. The designs are from actual petroglyphs found in Hawaiʻi and reflect the theme of the March 1996 and March 1997 lūʻau – “Mai Hanuana I Hanuana: From Generation to Generation” – God has been our dwelling place. 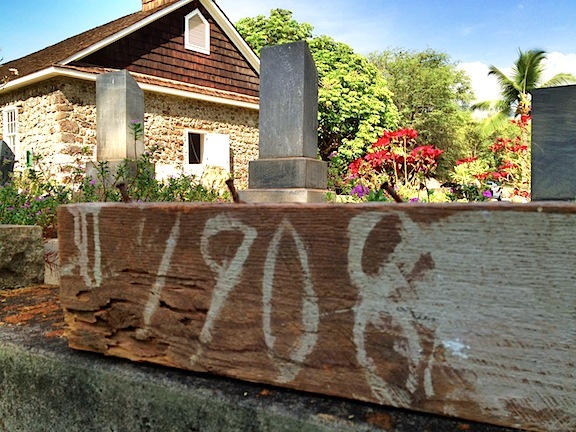 In the years that followed a portion of the stone wall on the mauka side of the church was restored by Sam Luʻuloa and later additional restoration was done by Johnny Pasco. In 1999 members of the church voted to renovate the Hale Äina. Funds were set aside for the work that began on June 1, 2000. The three-month project was completed in the early Fall and the building was dedicated and blessed on September 17, 2000. The members also voted in 1999 to establish a Long Range Planning Task Force that has been charged with the task of looking at the past, present and future. The task force began its work on December 4, 1999. Is committed to sharing God's aloha from generation to generation. 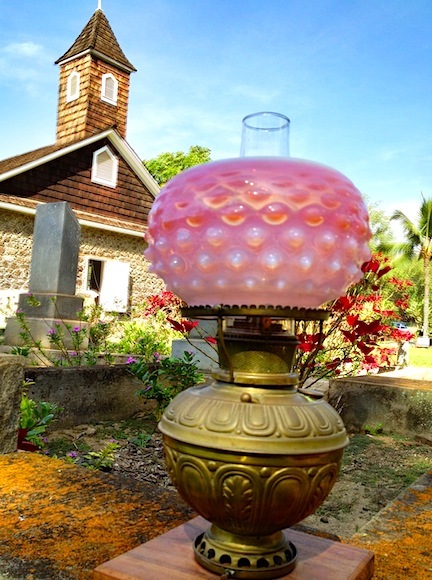 Kūpaa ma hope o ke aloha o Ke Akua mai kekahi hanauna a kekahi hanauna aku. we welcome all, love all, and accept all in to our 'ohana. heahea akula me ke aloha i nā lāhui a pau i ko mākou ohana ē.
uniting our Christian faith and Hawaiian heritage. hoolōkahi ia ka hoomana Kalikiano me ka moomeheu Hawaii ē. "Nā Pua O Ke Akua: In God's Flower Garden," a compact disc was recorded in September 2000. The CD includes Hawaian and English language hymns and anthems. The disc features Nā Leo Nahenahe, the more than 30-voice choir of the church. It was released on January 1, 2001. 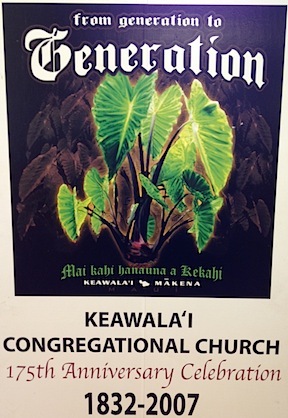 On Sunday, June 3, 2001 copies of the new Hawaiian language hymnal, Nā Hïmeni O Ka Ekalesia: The Hymns of the Church," were dedicated during the morning service. The hymnals were made possible through the gifts that were received from members and friends of the church. On that same morning, the new Allen Renaissance Organ was also dedicated. The organ was made possible through a donor gift. On Sunday, November 4, 2001 a dedication was made of 125 copies of the New Revised Standard Version of the Bible. In addition, 40 choir chairs were also dedicated along with the completion of the new roof for the Hale Pule. The dedication of the Bibles, chairs and roof were all made possible through the generous gifts of members and friends of the church. In 2003 a commitment was made to restore the exterior walls of the church. The Hale Pule Restoration Project was completed by Frank Williams and his crew from Kapili Hale, Inc., Wailuku in July 2004. In addition, work was a portion of the rock wall along Mākena Road was also completed at the same time by Uncle Johnny Pasco of Kïhei. A special dedication and blessing was held on Thanksgiving Sunday, November 21, 2004 celebrating the completion of both projects. 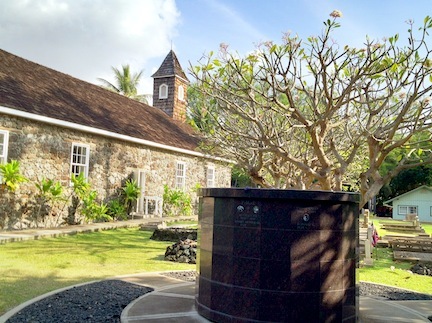 On Sunday, September 5, 2004 the columbarium known as Pōaialoha was dedicated and blessed. On Saturday, September 11, 2004 a Mākena Ohana Day was held for those who have family members buried in the cemetery. Both events were coordinated through the work of the Pā Ilina Ohana/Pōaialoha Committee. The church celebrated its 175th Anniversary over two seasons of the Makahiki. The celebration began at the start of the Makahiki on November 18, 2006 and concluded sixteen months later at the conclusion of the Makahiki for that year which ended with the annual lūʻau on March 10, 2007. A two-disk DVD set was produced by Ed Lane of Maui High End Video Productions that marked the start of the celebration with a hoʻolauleʻa that was held on Saturday, November 18, 2006. Presentations were made by Uncle Eddie Chang of Mākena and Kēpā Maly of Kumu Pono Associates on the history of the church and the surrounding area. In commemoration of the 175th Anniversary, the Music Ministry Program of the church commissioned Randie Kamuela Fong of the Kamehameha Schools Kapālama Campus, Honolulu, Oʻahu to compose an anthem in celebration of the occasion. After visiting Mākena and consulting with Stephen Haines, Director for the Music Ministry Program, Fong composed “Ka Malu O Keawalaʻi: In the Haven of Keawalaʻi”. In 2009 the restrooms of the church were remodeled in compliance with new EPA (Environmental Protection Agency) guidelines. The restrooms were opened on November 1, 2009 and a formal dedication and blessing was held at the conclusion of the quarterly congregational meeting that was held on Sunday, November 22, 2009. Kevin Harrington of Haliʻimaile produced a DVD of the 2011 Annual Lūʻau featuring the slack key music of Uncle George Kahumoku, Sterling Keaton and Pekelo; the hula of Hālau Nā Lei Kaumaka O Uka with Kumu hula Nāpua Greig Makua; and special guest Maisey Rika of Aotearoa. The DVD includes interviews with members of the Lūʻau Committee. Later that year, construction was completed on an outdoor pavilion adjacent to Hale O Kukahiko, the classroom and office building. The pavilion will provide additional space for church activities and programs. In 2013 work was completed on the restoration of the makai rock wall by stone mason Amanaki Ika. Gifts from four donor families made the restoration work possible. The church has made a commitment to maintain Hawaiian tradition and culture, to incorporate the use of Hawaiian language, music, and dance as well as to honor the various traditions and cultures represented in its membership within its ministry of worship and service. We give thanks to God for all who continue to provide support for the mission and ministry of the church. May generations to come say of us that we were faithful witnesses. Any opinions expressed in this website are those of the writer or writers involved. Unless otherwise noted, such opinions are not to be construed as the position taken by any of the boards, committees, or council of the church.